I attended Tarun Shibir for the first time this year from 3rd-5th February. The first full day began with early morning shakha involving intense warm-ups leading into energetic khel (games). Aside from their intensity, the diversity of khel was a hallmark, due in part to the fact that swayamsevaks from a variety of shakhas had come. For example, a variation of netball entailed launching a dand (stick) across the pitch instead of a ball. Shakha was not the only physical activity. As a group we walked and climbed the beautiful Malvern Hills, culminating in a picturesque view of the town. The refreshing walk and activities energised me to participate and focus on the discussions that lay ahead. Multiple workshops nicely broke up the physically demanding activities. The first focused on visualising a model of leadership espousing core elements of ‘head (jnana), heart (bhakti) and hands (karma)’, and involved groups working on various tasks and feeding back to the larger group at the end. Another workshop focussed on self-reflection, motivations for working and the relevance of shakha. We broke down our daily lives and compared them to a personal role model within Sangh. The evening activity, Mukta Chintan (free thinking) was an open discussion on anything Sangh-related and everyone had the opportunity to ask anything (one s’sevak even showcased some inspiring poetry!) Many interesting topics from, “how do I explain Sangh in one sentence”, “conversion of Hindus to other faiths”, to “How Brexit will effect us” were discussed in detail. Such relevant topics really goes to show how Sangh is willing to tackle problems head on and not simply dismiss them. On the final day, a very forthright, thought-provoking and inspiring talk was delivered, explaining the foundations on which Doctorji founded Sangh, and the reason why Sangh is vital even in today’s society. Tarun Shibir was definitely a weekend to remember for me. Some of the lessons learned will stay with me indefinitely. 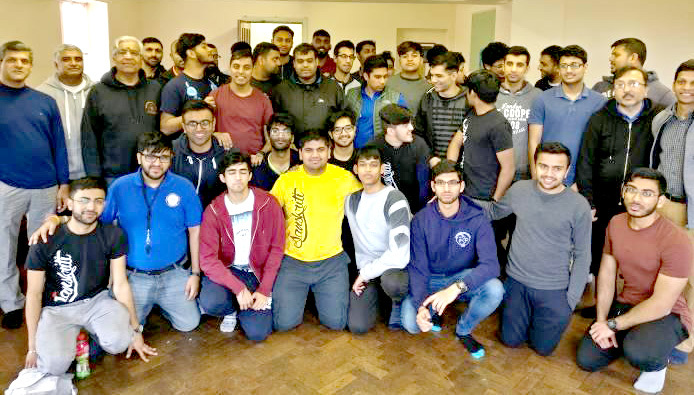 In my opinion, the reality of a vibrant atmosphere created by like-minded individuals from diverse places in the UK, each offering their own unique perspectives whilst living and eating under one roof for three days, is an unrivalled event, and I am delighted to have been part of that experience.